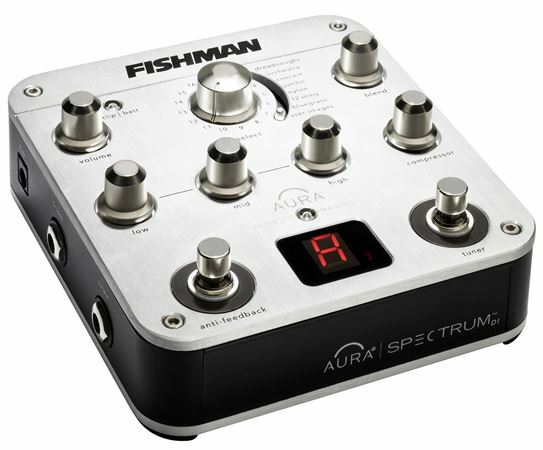 Shop Fishman AuraSpectrum DI Acoustic Imaging Pedal from AMS with 0% Interest Payment Plans and Free Shipping. 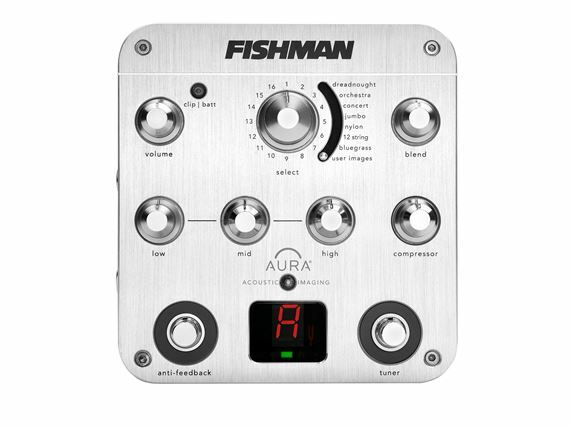 Fishman Aura Spectrum Acoustic DI Preamp; Award winning Aura Imaging built into a powerful DI. The Aura Spectrum DI from Fishman is the complete tone solution for the acoustic musician who wants the best possible acoustic tone at all times. Featuring award-winning Aura Acoustic Imaging technology, this DI preamp provides a brilliant studio-miked tonality to your undersaddle or soundhole pickup. I love the verstile tones this preamp provides. Using the guidelines in the manual I can recreate the acoustic sound of all my guitars, which, formerly all were predominatly quacky from the piezo pickup sounds. The only negative for me is the tuner sensitivity. You have to pluck the string pretty hard to get it to register. This is a big negative if you need to check tuning on a quiet stage or when you're waiting to walk on at the Bluebird! I use the D'Addario sound hole tuner in place of this one. The D can hear a gnat blink. Overall, still recommend this to make your acoustic sound right through FOH. Every acoustic guitar owner should buy this product it make your guitars so much better !!!! One of the best pedals I ever bought and worth every dime. It's well built and thought out. It will be one of those purchases you will never regret!!! THE ANSWER TO THE PROBLEM!! I'm sure we've all heard the saying, "Built like a tank." Well, this little box actually IS built like a tank. From the all metal (Heavy) construction of the housing to the quality that can be felt in the knobs and buttons when you use them. You can actually FEEL that this baby is made with the highest quality components and materials. I have only used the Spectrum in four performances so far. But I honestly don't foresee any problems in the future. I can see me using the Spectrum for years to come. I will NEVER part with it. If my Spectrum should be stolen (heaven forbid) I will purchase an identical model immediately. I have searched for YEARS to find that "tone." Any musician that plays an acoustic instrument knows exactly what I mean by this. Wewn we plug in, we are all looking for that rich, pure, deep sound that we get from our beloved instruments when playing unplugged. Personally, I play a Martin D-28 that I am in love with. But when I plug in, it's just another acoustic that sounds electric! I just couldn't get my baby's gorgeous acoustic sound when playing in amplified live performances. I tried many, MANY pick-up systems, different eq settings, mixers, DI boxes, effects units, blenders, pre-amps, even mics (too much feedback)- you name it and I've tried it. They ALL fell short! Then I bought the Spectrum. WOW!! Don't spend thousands of dollars like me playing the "trial-and-error" game. NO, this baby isn't cheap. But for what it does for your sound, in my opinion it is UNDERPRICED!! You'll LOVE it! Perfect made and easy to use. Excellent product. All acoustic guitarists need to have it as a friend. There are lot of mic preamp models and good opportunity to upload images from the library. Overall great unit. I'd prefer if it had separate in and out fx loop rather than insert type loop. tone varies depending on image and guitar used. I've only had it for several weeks, but so far, so good. Great combination of DI box functionality and the ability to blend high quality mic'ed guitar images with your guitar to get a sweet sound. Metal box which feels very solid and should be able to easily stand up to gigging. This box is a tone machine. Best bet is to check out Fishman's demo and other user's on Youtube.